This is a pretty good cereal. I've had complaints with other cereals that include freeze-dried strawberries. In those cases, the berry pieces had a near-Styrofoam texture and the fruit seemed more of a distraction than a pleasure. This cereal got it right. The texture and flavor of the freeze-dried strawberries blend well with the classic Rice Krispies cereal. I've always been one to add a teaspoon of sugar to original Rice Krispies. I didn't feel the need to do that here. The strawberry pieces add an additional light sweetness. The picture on the box shows more strawberries than there actually are. But that's okay. You get a berry in every second or third spoonful. That's just enough to give the new cereal distinction and still maintain the character of the original cereal. My only criticism is a little personal. I miss the good old days of cereal marketing. Cereal boxes used to be art - the height of commercial creativity. What a missed opportunity to introduce a new character - maybe simply named "Berry". On this box, it's nice to see the character "Crackle" holding up a large strawberry while "Pop" dumps pieces into a bowl from a basket. (Lazy "Snap" just looks on while the others work - like he's the one who will eat the cereal). But I keep thinking how fun it would be if they had a crazy new strawberry friend. "Berry" could swim in the cereal bowl. Maybe the other characters think he's a troublemaker... only to discover his antics add flavor to their cereal. Maybe he has super powers that add super flavor. Oh well. I guess we'll have to wait for the next animated blockbuster to see new characters on cereal boxes. It's all about cross-promotion now. The movie character Shrek not only appeared on a Lucky Charms box, General Mills created a Shrek cereal. Heaven forbid that a new character appears on a cereal box without the cereal manufacturer getting a paycheck from a movie company. That said... the bottom line is that I'd buy Rice Krispies With Real Strawberries again if the price was right. Of the cereals currently doing freeze-dried strawberries, this is one of the best. What do you think of Rice Krispies With Real Strawberries? 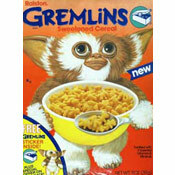 I loved this cereal and I still wish they would bring it back. I, too, loved the Rice Krispies with strawberries. I now know from this site, is that it has been discountinued. Bad choice for Kelloggs. I have resorted to buying freezed dried strawberries so that I can enjoy them with my Rice Krispies. The strawberries are everywhere online. But I would still like to buy them already in the cereal. I'm a disabled person, who has a hard time eating because of stomach and asaphagas problems. They cause me to have a terrible appetite and my disabilities keep me in pain all the time, but none the less, one day my husband brought home Rice Krispies cereal w/ strawberries and I loved them so much and I could eat them. I was buying 3 boxes at a time and eating them constantly. I can't find it here in northern Vermont either and its my favorite cereal ever...I didn't know if anyone knew where u can get it anymore? Please bring back the Rice Krispies with real Strawberries! I miss them terrribly! I'm sorry to report that this cereal has been discontinued by Kellogg's. Click here for a list of Kellogg's discontinued products. I really enjoy the cereal, but I can't find it anymore what happen? I love these Rice Krispies. However, i can't find anymore in my area. If anyone knows where i could order them i would appreciate it very much. Rice Krispie Fan Since the 1940s. Kellogg's, please don't tell me you've discontinued the best thing since the 1961 Corvette! Our 2-year-old grandson introduced us to Strawberry Rice Krispies, and it became an immediate favorite with everyone in the family. PLEASE BRING THIS PRODUCT BACK! WE ARE CRAVING IT! I can't find it either anymore and I had to resort to ordering from Peapod, and now they no longer carry it! I've written Kellogg's and suggest that everyone else does too! Please let me know at pate79@netscape.com if you no longer have the Rice Krispies with real strawberries available for purchase. If so, very bad. Miss it. I LOVE it and can't find it anymore! BRING IT BACK! 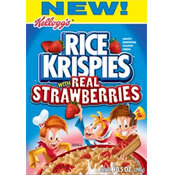 I am unable to locate the Rice Krispies Real Strawberry's in the local grocery stores or Walmart stores in my area. Is it possible to locate them anywhwere else. I live in Emanuel County, Georgia. Please let me know if they can be purchased anywhere else in this area. My e-mail address of Pate79@netscape.com. Thank you for your help in this matter. I, love this cereal, can't find it in markets anymore. Please bring it back to our stores. Love it and can't find it anymore. What's up?? I live in Massachusetts and cannot find this product any longer either. Know if any stores carrying it now? I live in Northern Virginia and I have bought this product once, loved it and now cannot find it anywhere. What''s up with that? Come on Kellogg's get with it and see your product fly. I can't find it either and it is all my elderly mother wants to eat! I really like this cereal and am now having trouble finding it. Is it being discontinued? I currently have 15 or so boxes of this at my home. Are they discontinuing? I am obsessed with these! Fry's in Phoenix do not carry this product anymore and I couldn't be more angry. When these were on sale for $2.50 I'd buy 4 boxes. Rice Krispies with Real Blueberries!?!?! I'd pay $6.00 a box for that. Love it! It's become one of my new favorites. This is a really good cereal. The problem is that it is ridiculously hard to find. The only place I know of that carries it is the Albertson's a few miles from my home. This cereal was great! I wish there was a place I could buy it now. The reason you don't feel a need to add sugar is not because of the strawberries - it's because the cereal itself is "lightly sweetened" per the front of the box. This is my new ultimate favorite cereal. And... BONUS, there is NO FAT! I really think the strawberries taste really good. But I think they would be better with blueberries in the cereal.